We are fifth generation ranchers who inherited a big problem; a degraded, overgrazed, eroded and unproductive piece of land. When we took over the ranch in 2003 it was unable to provide for itself and our family. It’s safe to say the ranch had suffered decades of abuse and neglect. Ever since the beginning, we saw potential and countless examples of nature’s resilience in the desert. These moments gave us hope to think outside the box and make the ranch a profitable operation once again. Today, it has become more evident to us the true potential this desert landscape has to offer. Ranching in a brittle environment with unpredictable annual moisture has come with plenty of challenges and also many successes. The location in which we ranch, much like many other arid parts of the world, evolved to support large herds of grazing animals. These groups of animals are essential to maintaining healthy ecosystem. Since 1/3 of the earths land surface is covered in arid, semi-arid or desert landscapes spanning six continents, we feel compelled to share our experiences with those who may benefit worldwide. We are seeing the regeneration of plush natural grasslands, an abundance of wildlife retuning and large grazing ruminates once again dominating the range. Since 2003 we have been able to triple our stocking rate. We are encouraged by the progress we have made in such a short time of converting barren soil into profitable forage. Transforming the land and improving the soil is a job that will never be complete. We are very enthusiastic about our work and hope to pass on the family ranch to the next generation in better condition than how we received it. 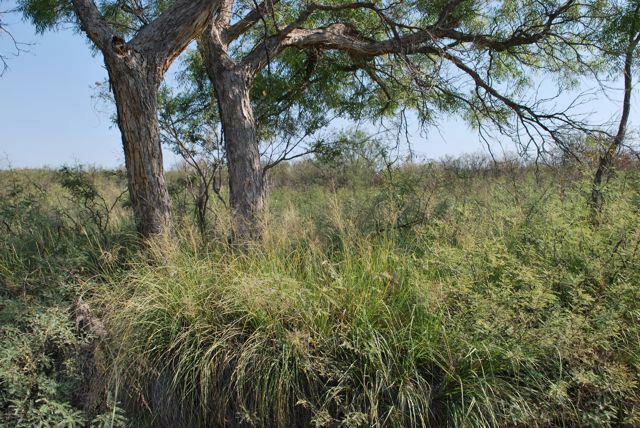 Our personal management goal is to stop desertification in the Chihuahuan desert ecosystem by maximizing grass production to its fullest potential at a minimal cost. This is achieved by increasing ground cover, utilizing well adapted cattle as our primary tool of restoration while also making a profitable business that works in sync with nature. Often we forget how cattle are meant to graze properly and it’s due to our own fault. Most of the world’s pastures have been degraded and overgrazed to historical low levels of productivity allowing desertification to take place. Cattle are not the ones to blame, its human negligence and ignorance. However, there is a solution: cattle. Cattle provide the tools necessary to restore the same damage that they are thought to have created. With proper management, cattle provide many essential benefits to restore ecosystems. They trample old growth and incorporate it into the ground speeding up the decomposition process. This also leads to the recycling of nutrients in an already nutrient deficient environment. Cattle also break the topsoil crust allowing moisture to penetrate deeper into heavy clay soils associated with desert lands. They act as a tool to properly aerate the soil providing a desirable environment for microbial and fungal communities to flourish. Cattle spread nutrients in the form of seeds and manure to infertile barren soil, promoting new plant growth. It must be understood only thru proper management and the comprehension of regenerative practices will ranchers and people responsible for managing such lands be able to benefit from all the incredible attributes of cattle. It’s our duty to manage these resources in sync with nature to ensure our environment is more productive, to promote biodiversity and provide habitat for wildlife. Our motto is simple; if we take care of our land and cattle, in return they will take care of us. Nothing holds more true than this. We are trying to replicate the animal grass relationship that you would see in nature within our own confined space. We discourage the use of supplemented feed, hormones, fertilizers or anything that would, in our opinion, not be a holistic approach. Some of the tools we use to achieve our desired goals are electric fencing both permanent and portable, herding, and proper grazing management. As my father likes to call it “rational grazing.” Rational grazing involves having an actual reasoning process on which to base your grazing plan. Our objective is to time our movements when plant nutrition is highest. Thus, constantly adjusting our grazing plan to be inline with the growth phase of forage. Our main reason for this management practice is to give our cattle the best quality feed. A healthy cow is a productive tool. For us in the desert there is no such thing as the predictability of nature. Things are always changing and so must our management. Remaining flexible and openminded to change will increase your operation to its fullest potential in an arid, chaotic environment. We are not married to any particular ideology or management method. We use all things as tools when the appropriate time presents itself. It is up to us to observe what is happening and more importantly to listen to our cows for which in turn will provide for us. Most importantly we believe ranching is a business not a hobby. If you are not going to approach it as a business what is the purpose of restoring, investing in and improving it if it is unable to maintain itself and provide a livelihood for those who work for it. "A healthy cow is a productive tool."